Ware draws attention to the significant personal toll of being involved in HIV and AIDS activism and the major—but often unseen—contributions that others made to the HIV and AIDS cause. 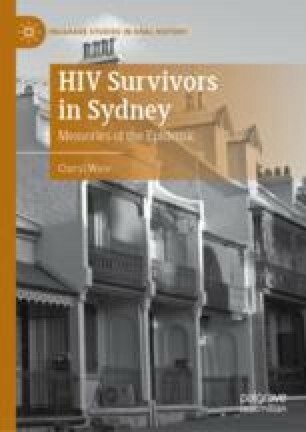 This chapter details HIV-positive gay men’s involvement in facilitating faster access to treatment, the human cost of participating in trials for the early antiretroviral medication, and narrators’ memories of caring for other gay men who were dying from AIDS-related conditions. Such discussions involved more misremembering, more pauses, and more explicit reflecting than that which emerged during any other part of the interviews. Ware demonstrates the complex ways narrators remember and reflect on these experiences several years later.